Have you checked your video drivers, try reinstalling them if you are using the latest version. Also check the settings in the config file, there is a mention of the lookup-gap in the error you are getting. You can also try to lower thread-concurrency to 2096, and gpu-threads to 1, also smaller worksize to 128 for example. Have in mind that even if yo do manage to make the card work, the performance you will get will from this model will be very low. 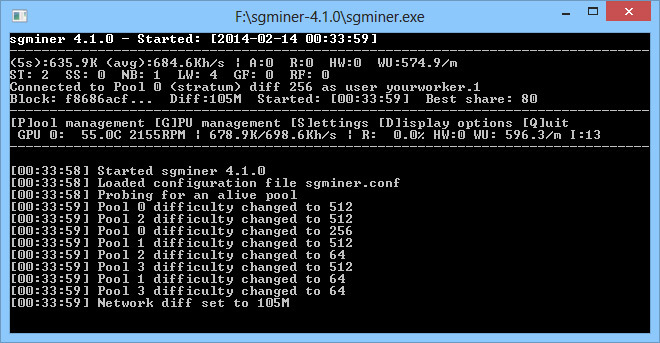 sgminer is based on cgminer 3.7.2, so there are quite a few differences than what your old version may use in the config and that could be a reason for the miner to not function properly. Also note that sgminer tries to push the GPU to the maximum, so cards that are overclocked to their limit and working with cgminer may show problems when switching to sgminer. If I were to start backing off the aggressiveness of some of my config, is there any possibility for improvement? If not I don’t see a point in upgrading now. Not the aggressiveness, but you might want to check your clocks and try with them lowered a bit. 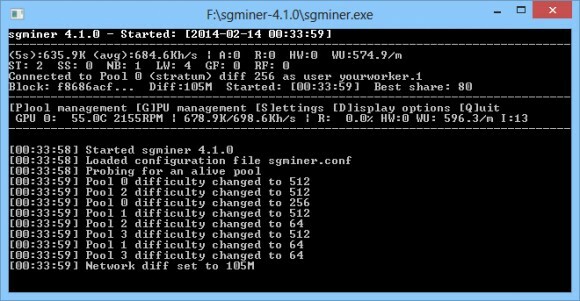 Also try with a new config just adding your pool and worker data, not moving all of the using the settings from the old cgminer. I think what might be causing the hardware errors (seen a few more) are restarts of sgminer after I’ve underclocked a few cards, or when I underclock cards while it’s running. I guess the next step seems to be finding the parameters needed to have sgminer handle that instead of Afterburner (hopefully it can).